Grace Anne Braxton, UMW Campus Dining and Special Olympics silver medalist. (Photo by Norm Shafer). Special Olympian golfer Grace Anne Braxton, a University of Mary Washington Campus Dining employee for more than two decades, putted her way to a silver medal at last month’s 2019 Special Olympics World Games in Abu Dhabi. And the campus community wants to celebrate! 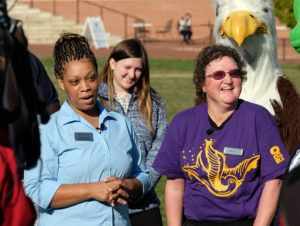 UMW will honor Braxton – whom many of us know as “Amazing Grace” – on UMW’s Ball Circle TODAY (Thursday, April 11), at 4:30 p.m., with all the fanfare Mary Washington can muster. Grace Anne Braxton. Photo by Scott K Brown Photography Inc. Please try to gather in front of the University Center at about 4:20 p.m. Sodexo will have an appreciation banner that everyone may sign, and cake will also be served (while supplies last!). Tune in to NBC this evening at 6:45 p.m. to see Grace Anne’s interview.